IGT Games have a long tradition and have been in land-based casinos for over 20 years. The range extends from video reels, video poker, skill games or multi level progressive games. IGT Games are also available for online and mobile players. To date, the American company has adapted 150 slots and games to the requirements of online casinos. Of course, they have focused primarily on the top games. That’s why today you can play slots like Action Jack, Deal or No Deal, Cleopatra, Golden Goddess and various table games on your desktop or mobile device. Casino.Com has now also released for UK players IGT Games. Also in the partner casinos the Slots Heaven and Mansion Casino IGT slots are playable now. You can already play some of the best titles, including Cleopatra, Wolf Run and Baywatch. These games are extremely successful in both land-based and online casinos. 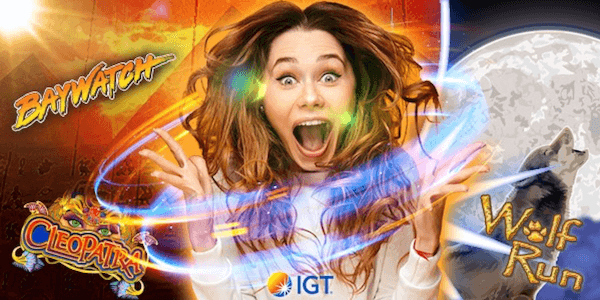 With the launch of the IGT Games, however, a new progressive jackpot has also gone online at Casino.Com. Any player who has ever won a progressive jackpot knows the feeling! A jackpot comes as a surprise and delivers a one-time and huge profit. From now you can get to know this feeling in the Casino.Com. You can even become a millionaire with the Mega™ Jackpot which has been started now. This jackpot has an average win of more than £800.000 and falls in a rhythm of about 5-6 weeks. The highest Mega™ jackpot ever won was £2.1 million! Among other slots, you can now win the Mega™ Jackpot at Casino.Com: Isle of Plenty, Cluedo, Cleopatra, Siberian Storm, Wolf Run and Monopoly. If you are wondering how to win this jackpot, we have this tip for you. Play one of the slots shown above. Each of the games has an additional symbol, the Mega™ Jackpots symbol. This you have to land on your middle reel pay-line 5x and your life definitely changes! It could not have been easier, but a good dose of luck is part of it! Incidentally, all online casinos pay this IGT jackpot in a single large sum! Casino.Com has another little surprise for you. The casino, the slots and of course the IGT Games you can get to know with a welcome bonus. The casino offers you a bonus for your first deposit as well as free spins. 180 free spins you activate along with your first deposit, and you get 20 free spins right after your registration – no deposit! The free spins can be played on all Age of the Gods slots. That includes Age of the Gods Fate Sisters, Furious 4, Goddess of Wisdom, Prince of Olympus or Ruler of the Sky. You can double your deposit up to £100. The minimum deposit required to activate the 180 free spins is £ 20. Wager requirements for the Free Spins is 20x and 40x for the bonus money. In addition to IGT Games, Casino.Com also offers slots from Playtech or Netent. The portfolio includes more than 400 slots and live casino games for UK players.